So much hoopla is made each year over Black Friday and in more recent years there have also been the shopping feeding frenzy days known as Small Business Saturday and Cyber Monday. While I'm all for scoring deals, supporting small businesses and the convenience of shopping online, I just don't know how anyone summons up the energy to do their holiday shopping the moment they're done with dessert on Thanksgiving. All I want to do is nap... or better yet, hibernate. Frankly, as much as I enjoy shopping, today my only plan after making this post, is to focus on efforts to clear out and donate stuff rather than acquire more of it. This time of year, there are like, a bazillion drives going on (food, toys, coats) and if this winter in NYC is anything like last year's polar vortex, then I think it's safe to say donations of coats are really going to be in demand. So for that reason, I decided to make this illustration and this post about New York Cares. 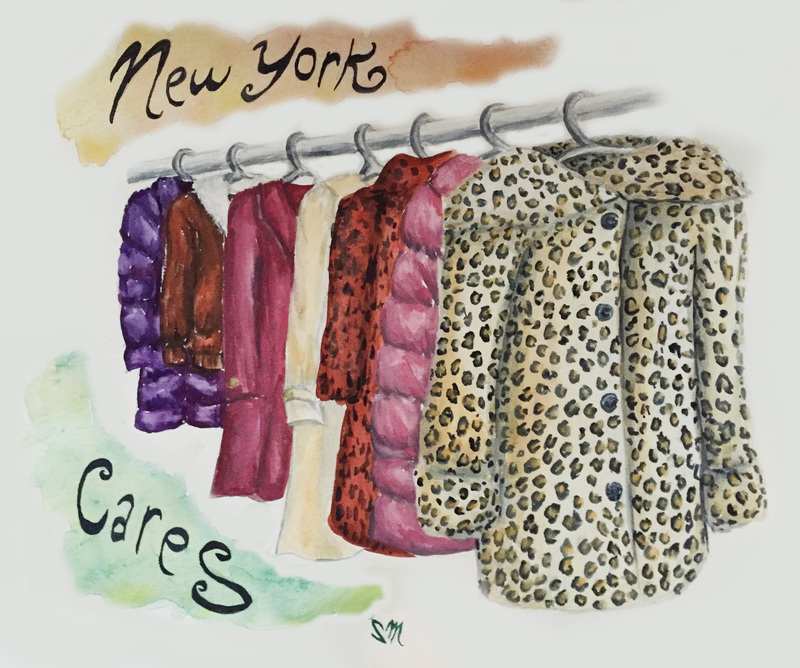 If you've ever walked past a sign on the street or seen one on the subway of a shivering Statue of Liberty, that's promoting New York Cares, a citywide coat and jacket drive. Donated coats get distributed to the homeless as well as others who need them. So if you think you might have a coat to spare, check out this page for a list of locations where you can drop one off. Obviously there are also other ways to donate coats, like bringing them to your local thrift shop if that's your preference. I'm just focusing on this drive, because it seems like a pretty concentrated effort that aims to collect 100,000 coats each winter.